Social determinants (SDs) of health (social, economic, legal, environmental, other) are not part of the Emergency Medicine core curriculum. However, Emergency Departments bear a disproportionate burden in caring for patients who are un- or underinsured. Some residencies have identified teaching SDs as important to improving patient care and have taught in classroom or in situ using methods such as an orientation month including activities such as home visits, community tours, and community visits, rotating at community organizations. SDs have not been part of our curriculum until now. We incorporated the Missouri Community Action Network's Poverty Simulation during Intern Orientation (2017) to give the interns from emergency medicine, family medicine, internal medicine, obstetrics and gynecology, an understanding of the challenges our patients face with SDs so that they would factor in SDs as part of their treatment plan. 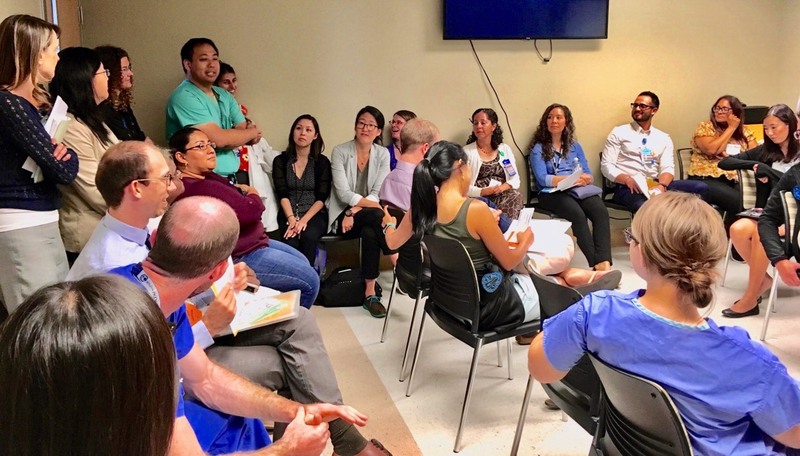 Interns from emergency medicine, internal medicine, family medicine, and obstetrics and gynecology are about to experience a Poverty Simulation during Intern Orientation at Harbor-UCLA Medical Center. Dennis Hsieh, IDHEAL-UCLA Faculty, is lead author on "Poverty Simulation: An Experimental Learning Tool for Teaching Social Determinants of Health" published in AEM Education and Training, Jan 2018. 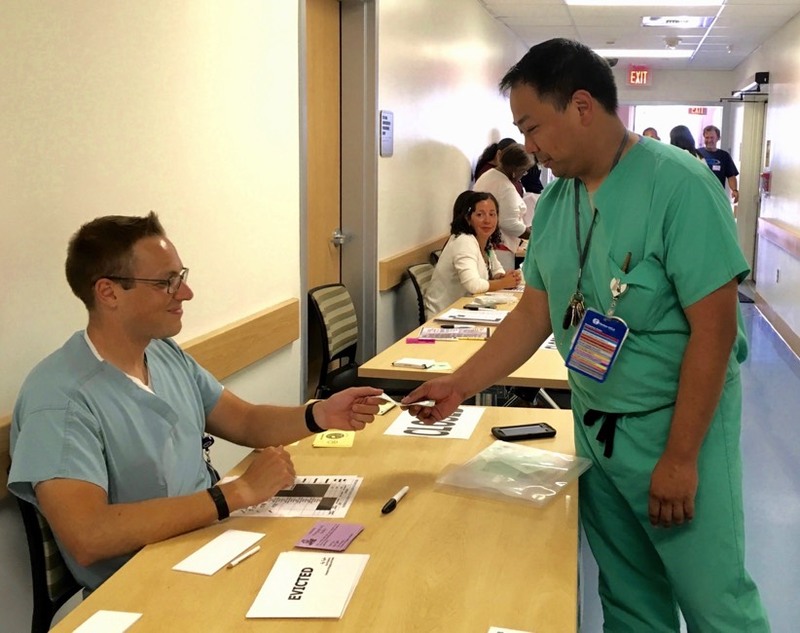 Dennis Hsieh, IDHEAL-UCLA Faculty, struggles with paying the rent during the Poverty Simulation at Harbor-UCLA Medial center. 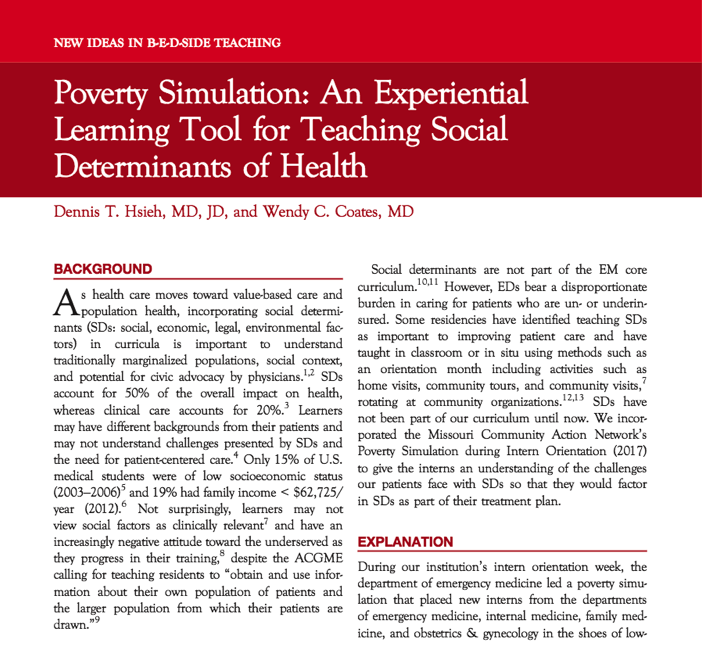 Poverty Simulation Sample Room Setup from "Poverty Simulation: An Experimental Learning Tool for Teaching Social Determinants of Health" published in AEM Education and Training, Jan 2018.